As a trained nutritionist and professional chef, Dra. 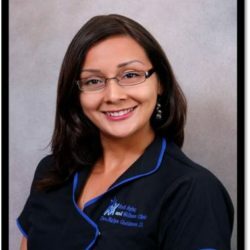 Diaz has been helping patients with their nutritional goals, at the Anti-Aging and Wellness Clinic, since 2013. Accepted with honors to the School of Dentistry at the Universidad Internacional de las Americas, she quickly learned her calling was not dentistry but health and nutrition. She decided she could better serve patients as a Nutritionist and Chef. She earned her Doctorate in Nutrition at the Universidad Hispanoamericana and complete her training as a professional Chef at El Secreto de Chef. Dr. Diaz works with each patient to help develop a customized nutrition plan designed to meet his or her individual goals. It is her passion to help patients achieve their peak physical performance. In addition to her work with patients at the Anti-Aging and Wellness Clinic, Dr. Diaz also works to optimize the health and wellbeing of the children at the Arthur Gough State Orphanage. She evaluates each child’s nutritional needs, guides the staff kitchen with meal plans and meal preparation, enabling each child to attain peak health. While under her care, the health of the children has improved 84%. Her goal is to reach 100% and she continues to monitor and refine the diets of those children requiring additional care.